Since the British V8 meet in June, I've replaced the axle shafts with stronger, custom made items. This was required because I broke one of the original shafts and twisted the other... 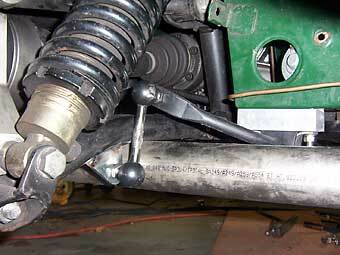 I also found a way to install an MG Midget rear sway bar to the Hoyle suspension. (See photos below.) I've discovered I can fit 16 x 7 wheels with 215 width tires, with no fender flares. This is an advantage of setting 2 degrees of negative rear camber! However, the wheels and tires will have to wait until later. I like the Hoyle Engineering independent rear suspension, but like the stock MGB-GT rear suspension, it doesn't come with any provision for an anti-sway bar. Body lean on corners isn't desirable because: 1) as a car leans, the suspension geometry changes unfavorably, 2) weight is transferred to the outside tires, reducing the load on the inside tires and thus the total available traction, and 3) responsiveness is reduced because the car does not take a stable line until it has finished leaning. Body lean can be reduced by fitting stiffer springs, or sway bars, or both. 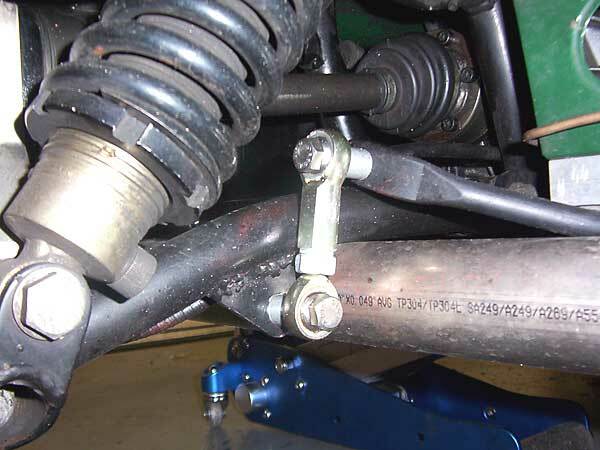 In general, sway bars are a better alternative to stiffer springs because real world road surfaces aren't ideal. With stiff springs, the wheels are more likely to bounce over the road surface, and when the wheels are not on the ground, they are not guiding the car. Soft springs with good damper control usually work well as far as maintaining tire contact, but then body lean becomes a problem. This is where sway bars can help. They have minimal effect on bump response, but can be very effective in keeping lean under control. Most MGBs are fitted with a front bar only. (Note: early roadsters came from the factory with a 9/16" front bar only. All GTs came from the factory with a 5/8" front bar only. For a couple years after converting to rubber bumpers, MG failed to fit any anti-sway bars at all to the roadsters... but that was madness. After they came to their senses, MG fit both front and rear bars on roadsters until the end of production.) 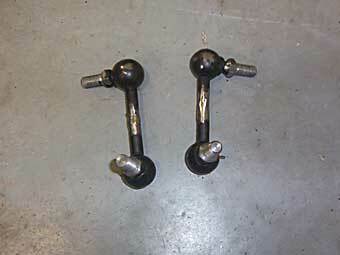 To reduce sway, the stock anti-sway bars have often been upgraded by owners to a 3/4" or 7/8" bar. This is effective in keeping the body more level, but the extra roll resistance is transferred to the outside front wheel. This can overload the tire, and cause understeer. In extreme cases, cornering grip will be little better than when no sway bar is fitted, although the reduced lean will still make the car feel more responsive. However, better suspension geometry also increases the effectiveness of wider tires, and better tires certainly increase cornering grip. For example, we have all seen pictures of old street/race cars where the inside front tire is off the ground on a hard corner (extra chassis stiffness from a roll cage also helps). For better balance, adding a rear bar is a good idea. A rear bar transfers some of the roll resistance to the outside rear wheel which reduces the load on the outside front tire, thus increasing the front grip and reducing understeer. In the rear, the inner tire will lose some loading, and wheel spin becomes more likely in a car without a limited slip differential. However, if the roll resistance is chosen properly, the compromise between weight transfer, suspension geometry, and roll resistance transfer will result in a higher cornering grip, and a more neutral feel. My MGB was previously fitted with a 7/8" front anti-sway bar, and I decided to fit a rear bar to help balance it. The Hoyle suspension did not come with any provision for a rear bar, so I started looking for something that I could adapt. Because the MGB is very narrow by contemporary standards, there are few bars that could fit. I confined my search to similar narrow cars and decided that a Midget/Sprite front bar would probably fit. So I went ahead and ordered the complete set of parts including links and brackets. Upon arrival, a test fit showed that this bar would indeed package neatly. I continued with the installation. To begin, I cut the brackets attaching the links to the Midget front A-arms to a different shape and welded them to the lower front sections of the rear A-arms just outside of the exhaust. I cut the links and welded them back together so the two fittings were at 90 degrees to each other. Then I made spacers from 1 inch thick aluminum plate to attach the bar to the bottom of the battery boxes. That was all there was to it. ...go under the battery boxes to hold the sway bar brackets. MG Midget attachment links were cut and re-welded. The welding must be done carefully (quickly) to avoid melting the rubber! They worked... but I decided to replace them with adjustable links. Advantage: increased stiffness from eliminating the rubber ends. 1/2 inch ID spacers (bought locally and cut to length). The Heim joints facilitate side-to-side adjustment. There is actually more clearance here than it appears! The rear sway bar made a noticeable improvement: the steering is more responsive, cornering grip seems higher and is very neutral in feel, and the car is more stable at all speeds. It was also very evident that traction was greatly improved in low speed, second gear corners. Overall, the sway bar has increased the overall level of confidence in the car. This was a very worthwhile project. I have a limited slip differential which is usually recommended with a rear sway bar. However, I suspect that even with an open differential there would be very significant improvements; with the possible exception of the low speed second gear corners. The 1/2" MG Midget rear bar seems a good compliment to my 7/8" front sway bar. A 3/4" Midget bar is available, but it will not fit due to it having longer arms than the 1/2" bar. The effectiveness of an anti-sway bar isn't simply a function of its thickness. The stiffness of its mounting and the mechanical advantage of the lever-arms that act on it also factor in. 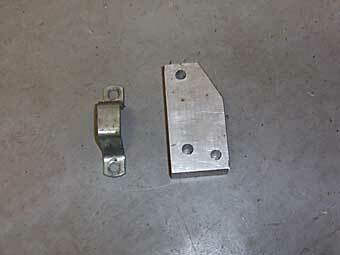 The short arms of the 1/2" MG Midget bar mean that it provides more roll resistance than a 9/16" MGB front bar. There is also bad news. I broke one rear axle shaft and twisted the other! 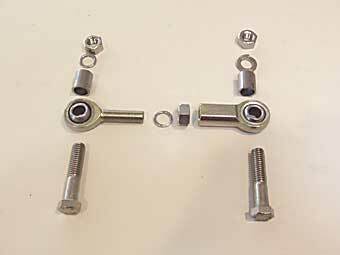 The Hoyle suspension uses shortened Merkur/Scorpio axles. 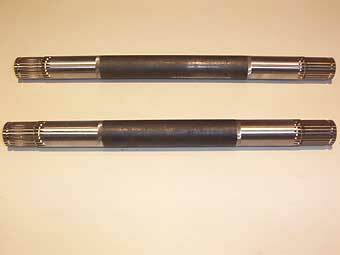 To shorten them, a section of larger diameter tubing has been fitted as a "splice" in the center of each shaft and it's welded at either end. Diameter changes and welds create stress risers, so perhaps it should be no surprise that this is where the shafts broke. 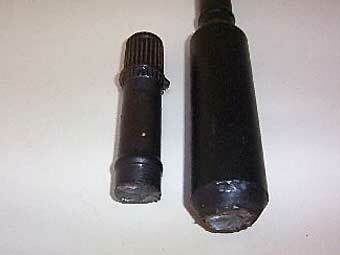 I ordered custom replacement shafts from Dutchman Motor Sports in Portland, Oregon. These are of a constant diameter and are made of high grade chrome-vanadium steel. For what they cost I expect them to last forever. 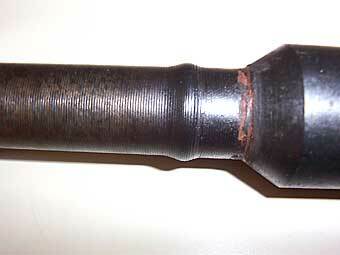 Fatigue failure: broken axle shaft. The other axle shaft had cracked too. 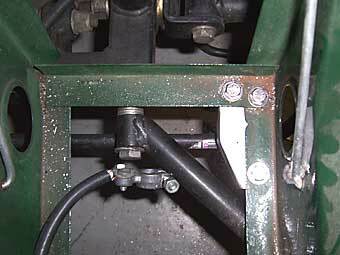 Better design: unspliced axle shafts. Disclaimer: This page was researched and written by Larry Shimp. Views expressed are those of the author, and are provided without warrantee or guarantee. Apply at your own risk. Photos by Larry Shimp. All rights reserved.